Cookies are one of my favourite snacks to well, snack on! Are they one of yours too? CHOCOLATE! Yass! The best ingredient ever and I wanted to create another chocolate cookie for you guys and a healthy one at that! 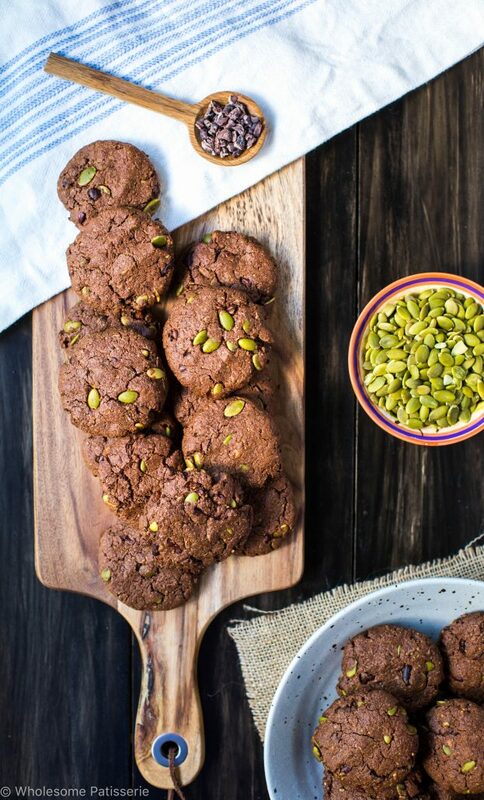 Chocolate and pumpkin seed cookies! They’re gluten free, vegan and absolutely divine! 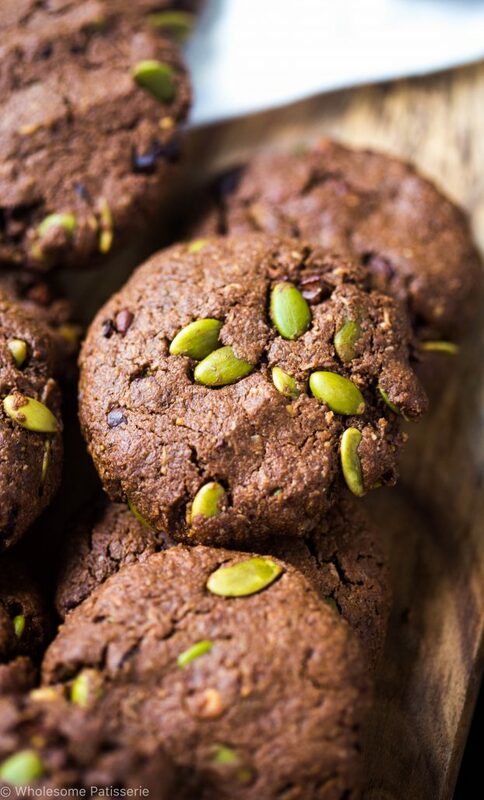 I adapted a recipe from Angela’s Trail Mix Cookies from Oh She Glows into these gorgeous chocolatey pumpkin seed beauties. Here are just a few of the benefits of pumpkin seeds! Convinced that you need to make these for you, your family and your friends??! What else is wonderful about these cookies? CACAO NIBS! How good are cacao nibs? I have used them in recipes on and off but always found them to be quite bitter. Now, since I’ve been consuming raw cacao powder on a regular basis, the cacao nibs taste sweet to me and they’re the perfect chocolate chip replacement in these healthy cookies. I promise, you will love them! Do you use them? 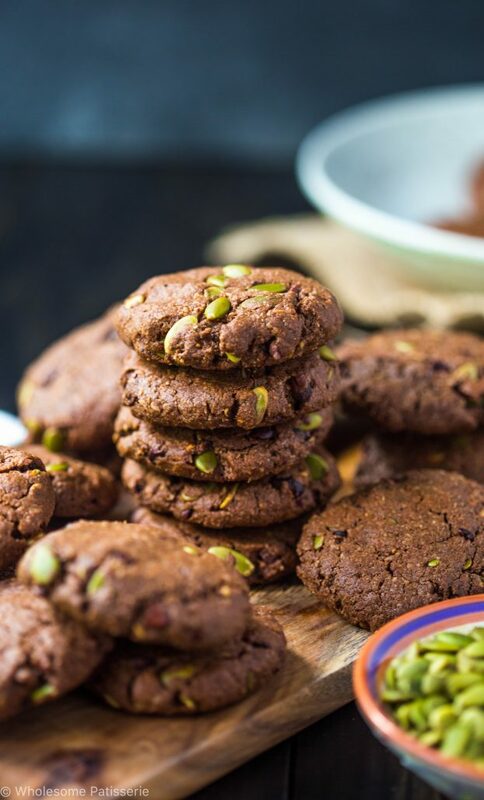 Not only are these gluten free and vegan but these cookies offer nourishing ingredients, plus they’re so simple to make! Whip up a batch so quick, bake them and voila! Now you have yourself a glorious batch of homemade chocolate cookies, yay! If you read my previous post, you will know that I’m trying to create healthier options. The majority of my recipes are quite healthy but I want to take it to the next level and challenge myself (including you) to limit the sugar and dairy. These cookies do have coconut sugar and maple syrup, but no refined sugar and if you want, you can omit the maple syrup and use 2 flax eggs instead of 1. Coconut sugar is definielty a better option compared to those nasty white sugars and also rapadura sugar for more of a variety. These are also completely vegan, yay! I NEVER have used a flax egg in my recipes on my blog (unless I’m forgetting one?) but I think this is the beginning of something special, are you as excited as I am?! 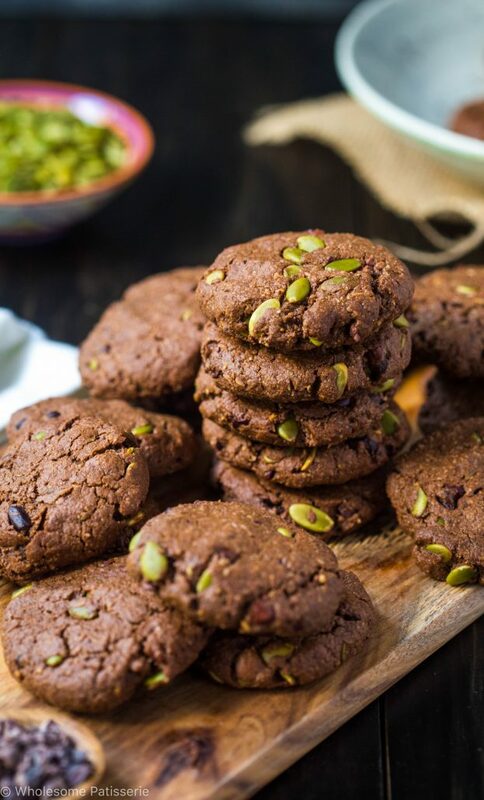 I hope you enjoy these delightful chocolate and pumpkin seed cookies, they will be one to make again and again! Preheat oven to 180ºC (356ºF), line a baking tray with parchment paper, set aside. Make flax egg by mixing together the ground flax and water, mix well and set aside to thicken. In a large mixing bowl, combine all dry ingredients until well blended, set aside. In a small mixing bowl, combine all wet ingredients and prepared flax egg. Pour wet mixture into dry, mix until smooth and well combined. Roll mixture into balls, approx. the size of a golf ball. Place on prepared tray and press down to create a thick round disc. Bake for 10-12 minutes or until cookies crack slightly on top and turn lightly golden around the edges. Store in an airtight container, refrigerated or in the pantry for 1 week - 10 days. If you don’t have gluten free oat flour, simply process gluten free rolled oats into a fine flour. These look so tasty! I love a good healthy treat. Can’t wait to try them!